Calling All Agile Practitioners in India! Wish researchers would listen to what practitioners had to say? Want to make a difference to the state of Agile practices and research? Have experiences of Agile software development you want to share? We invite you to participate in a large-scale, international research study on “Becoming a Self-Organizing Agile Team”. With the increasing popularity of Lean and Agile methods, more and more software teams are faced with the challenge of becoming self-organizing Agile teams. This research aims to explore the process followed by software development teams in order to become self-organizing Agile teams. Findings of this research will provide guidance for teams attempting to adopt Agile and become self-organizing as well as highlight the potential pit-falls to avoid in the process. Whether you are junior developer, tester, project manager, Scrum Master, or a CEO – your experiences count! Any software practitioner who has a minimum of 2 years industrial experience in practicing Lean and Agile software development (XP/Scrum/Kanban) can participate in this research. We’ll come to you! All it takes is approximately an hour of your time for a face-to-face, semi-structured interview about your experiences. Research findings will be published in academic and practitioner-based journals, conferences, and magazines. I will be happy to share these with participants. Where a number of participants come forth to participate from a single organization, I will be happy to present a seminar or talk based on my research work for the benefit of your organization. Details of the participants, their companies, and all information shared by participants will be kept confidential. Any publications or reports will not mention any specific names or details which make the participant or their company identifiable. Your support of this research is greatly appreciated! We received some excellent research papers from around the world. After peer-review by our international Program Committee, we have selected 7 long, 4 short, and 4 position papers for the Agile India 2012 Research Stage. I’ve captured some of my own experiences (fun and trails) of using Grounded Theory as a research methodology to study Software Engineering in a patterns paper presented at the Patterns Languages of Programs Conference (PLoP) in Portland, USA recently. Comments most welcome! 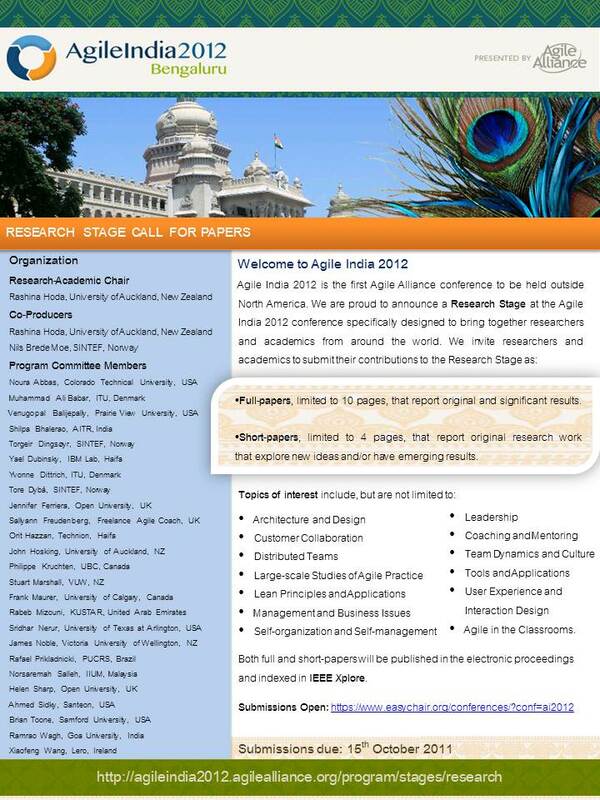 We are proud to announce a Research Stage at the Agile India 2012 conference to be held in early February 2012 in Bengaluru, India. Sponsored by the Agile Alliance, Agile India 2012 is a premier international event on Agile Software Development for researchers and practitioners alike. We invite researchers to submit their contributions to the Research Stage. We aim at bridging the gap between research and practice, and encourage submission of case studies, action research studies, grounded theory studies, experiments, surveys and literature reviews. Full-paper: We invite researchers to submit original research work that has led to significant and validated results. Full-papers are limited to 10 pages. Authors are required to describe motivation for research, research design/method and results. A discussion of background and related literature is recommended. Authors of accepted full-papers will be invited to give a short presentation at the conference. Short-paper: We invite researchers to submit original research work that explore new ideas and/or have emerging results. Short-papers are limited to 4 pages. Authors of accepted short-papers will be invited to prepare a poster summarizing their work. Papers will undergo a rigorous double-blind peer-review process, by reviewers selected from the program committee. Both full-papers and short-papers will be published in the electronic proceedings and indexed in IEEE Xplore. Papers must follow the IEEE Proceedings format to be reviewed (http://www.computer.org/portal/web/cscps/formatting). Author information must be removed from submissions. Submissions must be in PDF format.